Vitamin D not linked to shortsightedness. Flickr photo from Jonas Seaman. New findings from the Avon Longitudinal Study of Parents and Children suggest that children with low levels of vitamin D in their blood are not at increased risk of developing myopia (short-sightedness). 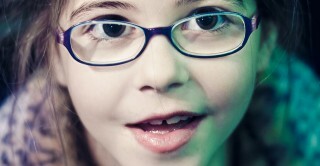 There has been a steady increase in the number of children who become short-sighted over recent decades, with more than a third of young adults now needing to wear glasses to correct the condition. One aspect of modern life that may be partly to blame is the reducing amount of time we spend outdoors during childhood. For reasons that are poorly understood, children who spend more time outdoors are protected against becoming short-sighted. For instance, in a previous Children of the 90s study, children who spent more time outdoors at age 8-9 were only about half as likely to become short-sighted by the age of 15 [Time outdoors looks good for children’s eyesight]. Vitamin D can be obtained from the diet, but crucially it is also made naturally by the body when the skin absorbs sunlight. Researchers have therefore considered that the protective effects of being outdoors against short-sightedness might be due to a boost of vitamin D in the blood. However, the new study found that blood levels of vitamin D could not account for the protection against short-sightedness afforded by spending time outdoors. ‘So we will search for other explanations and in the meantime keep encouraging and helping children to leave the house, even on these short winter days, as vision seems to be one of the many benefits for children of playing outside’.